Using Joe Lunardi's bracket projections, get updated tournament odds for the field of 68 and see who is most likely to win the National Championship. 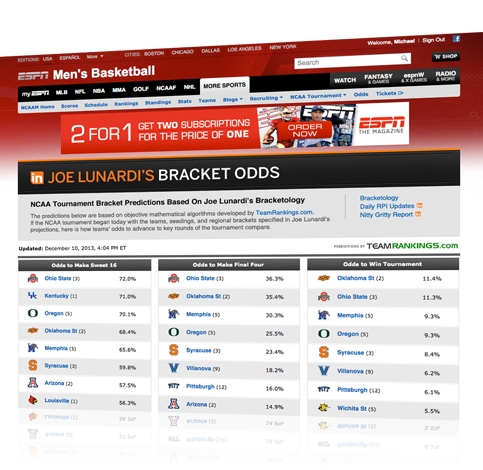 Get weekly updates on Joe Lunardi's S-Curve, a formula that determines the seedings for the tournament contenders. Receive Insider analysis from Jay Bilas, Jeff Goodman, Fran Fraschilla, Seth Greenberg, Miles Simon and more throughout the college basketball season.